Weather in Wevelgem at 2:00 PM, local time: 12C (54F), partly cloudy, with the wind from the NNW at 13 km/hr (8 mph). No rain was forecast. The crisp and cold morning saw most of the riders start the day in arm and leg warmers. With 120km to ride before the first climbs of the day, riders would have plenty of time to get warmed up, but this didn’t mean the start was going to be relaxed. The hard pace from the drop of the flag meant a break didn’t go until 35km had been covered, but once the group of six made their move, they really pushed ahead – creating a significant ten-minute gap that spurred the chasing peloton on to reduce their advantage. The race started in Deinze at 11:30 AM. As always, German National Champion, Marcus Burghardt, was the key player in reducing the break’s lead, cutting it in half over 50km. 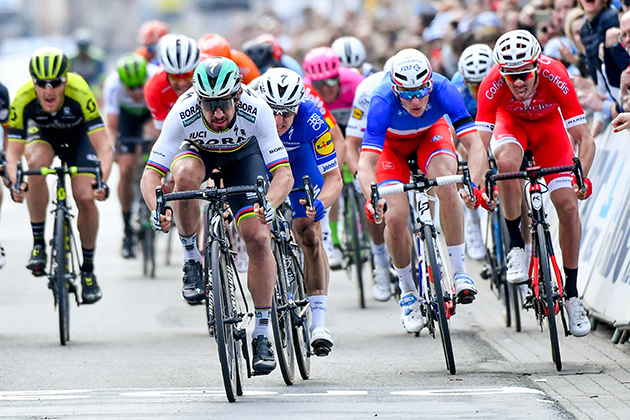 With Daniel Oss adding to Marcus’ efforts, the pace left some of the peloton dropping off the back, but on the front, a small group, with UCI World Champion, Peter Sagan, in the mix, broke off, first making the catch on the break, before leaving them behind. One of these twenty-three riders, with the group made up of some of the big favourites, would be the race’s winner, and the Slovak rider still had Marcus with him to keep him safe. In the final 2km the attacks came, but Peter stayed calm, saving his energy and keeping a cool head. 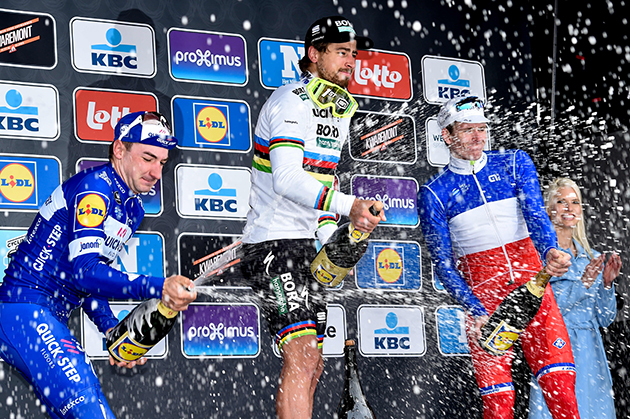 Starting his sprint from a long way out, nobody could touch the UCI World Champion, and once he was out in front, there was no chance of anyone taking his third Gent-Wevelgem win from him. 2 Elia Viviani Quick-Step Floors s.t. 3 Arnaud Démare Groupama-FDJ s.t. 4 Christophe Laporte Cofidis s.t. 5 Jens Debusschere Lotto-Soudal s.t. 6 Oliver Naesen Ag2r La Mondiale s.t. 7 Matteo Trentin Mitchelton-Scott s.t. 8 Zdenek Štybar Quick-Step Floors s.t. 10 Wout van Aert Veranda's Willems-Crelan s.t. 11 Sacha Modolo EF Education First-Drapac s.t. 12 Jan-Willem van Schip Roompot-Nederlandse Loterij s.t. 13 Michael Matthews Team Sunweb s.t. 14 Greg Van Avermaet BMC s.t. 15 Julien Vermote Dimension Data s.t. 16 Vyacheslav Kuznetsov Katusha-Alpecin s.t. 17 Philippe Gilbert Quick-Step Floors s.t. 18 Marcus Burghardt Bora-hansgrohe s.t. 19 Brian van Goethem Roompot-Nederlandse Loterij s.t. 22 Guillaume Van Keirsbulck Wanty-Groupe Gobert s.t. 25 Alexander Kristoff UAE-Team Emirates s.t. 31 Alex Kirsch WB-Aqua Protect-Veranclassic s.t. 33 Jasha Sütterlin Movistar s.t. 34 Mike Teunissen Team Sunweb s.t. 35 Dries Van Gestel Sport Vlaanderen-Baloise s.t. 36 Koen de Kort Trek-Segafredo s.t. 37 Bert Van Lerberghe Cofidis s.t. 38 Timo Roosen LottoNL-Jumbo s.t. 40 Frederik Frison Lotto-Soudal s.t. 41 Jelle Wallays Lotto-Soudal s.t. 42 Danny van Poppel LottoNL-Jumbo s.t. 43 Filippo Ganna UAE-Team Emirates s.t. 44 Daniel Oss Bora-hansgrohe s.t. 45 Gianni Moscon Sky s.t. 46 Alexey Lutsenko Astana s.t. 47 Florian Sénéchal Quick-Step Floors s.t. 48 John Degenkolb Trek-Segafredo s.t. 49 Heinrich Haussler Bahrain-Merida s.t. 50 Sebastian Langeveld EF Education First-Drapac s.t. 52 Rudy Barbier Ag2r La Mondiale s.t. 53 Ryan Gibbons Dimension Data s.t. 54 Rick Zabel Katusha-Alpecin s.t. 55 Juraj Sagan Bora-hansgrohe s.t. 56 Gijs Van Hoecke LottoNL-Jumbo s.t. 57 Jérémy Lecroq Vital Concept s.t. 58 Edward Planckaert Sport Vlaanderen-Baloise s.t. 59 Lars Bak Lotto-Soudal s.t. 60 Marcel Sieberg Lotto-Soudal s.t. 61 Julien Duval Ag2r La Mondiale s.t. 62 Huub Duyn Veranda's Willems-Crelan s.t. 63 Christophe Noppe Sport Vlaanderen-Baloise s.t. 64 Stefan Küng BMC s.t. 65 Michael Schär BMC s.t. 66 Roy Curvers Team Sunweb s.t. 68 Jorge Arcas Movistar s.t. 69 Zico Waeytens Veranda's Willems-Crelan s.t. 70 Owain Doull Sky s.t. 71 Olivier Le Gac Groupama-FDJ s.t. 72 Boy van Poppel Trek-Segafredo s.t. 73 Hugo Houle Astana s.t. 74 Laurens De Vreese Astana s.t. 75 Carlos Barbero Movistar s.t. 76 Nélson Oliveira Movistar s.t. 77 Christian Knees Sky s.t. 78 Francisco Ventoso BMC s.t. 81 Edvald Boasson Hagen Dimension Data s.t. 82 Pim Ligthart Roompot-Nederlandse Loterij s.t. 84 Kristijan Koren Bahrain-Merida s.t. 85 Ignatas Konovalovas Groupama-FDJ s.t. 86 Jimmy Duquennoy WB-Aqua Protect-Veranclassic s.t. 87 Jacopo Guarnieri Groupama-FDJ s.t. 88 Simone Consonni UAE-Team Emirates s.t. 89 Héctor Carretero Movistar s.t. 90 Ian Stannard Sky s.t. 91 Tom Devriendt Wanty-Groupe Gobert s.t. 92 Maarten Wynants LottoNL-Jumbo s.t. 94 Jos van Emden LottoNL-Jumbo s.t. 95 Jürgen Roelandts BMC s.t. 96 Tom Scully EF Education First-Drapac s.t. 97 Mathew Hayman Mitchelton-Scott s.t. 98 Cyril Lemoine Cofidis s.t. 99 Dylan van Baarle Sky s.t. 100 Jack Bauer Mitchelton-Scott s.t. 101 Alexander Edmondson Mitchelton-Scott s.t. 103 Floris Gerts Roompot-Nederlandse Loterij s.t. 104 Kenneth Van Rooy Sport Vlaanderen-Baloise s.t. 105 Luke Durbridge Mitchelton-Scott s.t. 106 Benjamin King Dimension Data s.t. 107 Stijn Vandenbergh Ag2r La Mondiale s.t. 108 Antoine Duchesne Groupama-FDJ s.t. 109 Tanguy Turgis Vital Concept s.t. 110 Ramon Sinkeldam Groupama-FDJ s.t. 111 Jay Thomson Dimension Data s.t. 112 Bert De Backer Vital Concept s.t. 113 Lukas Spengler WB-Aqua Protect-Veranclassic s.t. 114 Geoffrey Soupe Cofidis s.t. 115 Mark McNally Wanty-Groupe Gobert s.t. 116 Gediminas Bagdonas Ag2r La Mondiale s.t. 117 Kenneth Vanbilsen Cofidis s.t. 118 Marco Marcato UAE-Team Emirates s.t. 119 Michael Van Staeyen Cofidis s.t. 120 Sjoerd van Ginneken Roompot-Nederlandse Loterij s.t. 121 Alberto Bettiol BMC s.t. 122 Iván García Bahrain-Merida s.t. 123 Kristoffer Halvorsen Sky s.t. 124 Sonny Colbrelli Bahrain-Merida s.t. 125 Julien Stassen WB-Aqua Protect-Veranclassic s.t. 126 Oliviero Troia UAE-Team Emirates s.t. 127 Ben Swift UAE-Team Emirates s.t. 128 Alex Dowsett Katusha-Alpecin s.t. 129 David Per Bahrain-Merida s.t. 130 Jenthe Biermans Katusha-Alpecin s.t. 131 Borut Božic Bahrain-Merida s.t. 132 Michael Hepburn Mitchelton-Scott s.t. 133 Nicolas Dougall Dimension Data s.t. 134 Luka Pibernik Bahrain-Merida s.t. 135 Michael Goolaerts Veranda's Willems-Crelan s.t. 136 Taylor Phinney EF Education First-Drapac s.t. 137 Pieter Vanspeybrouck Wanty-Groupe Gobert s.t. 138 Tim Declercq Quick-Step Floors s.t. 139 Jempy Drücker BMC s.t. 140 Tom Leezer LottoNL-Jumbo s.t. 141 Bryan Coquard Vital Concept s.t. 142 Maciej Bodnar Bora-hansgrohe s.t. 143 Oscar Gatto Astana s.t. 144 Kenny Dehaes WB-Aqua Protect-Veranclassic s.t. 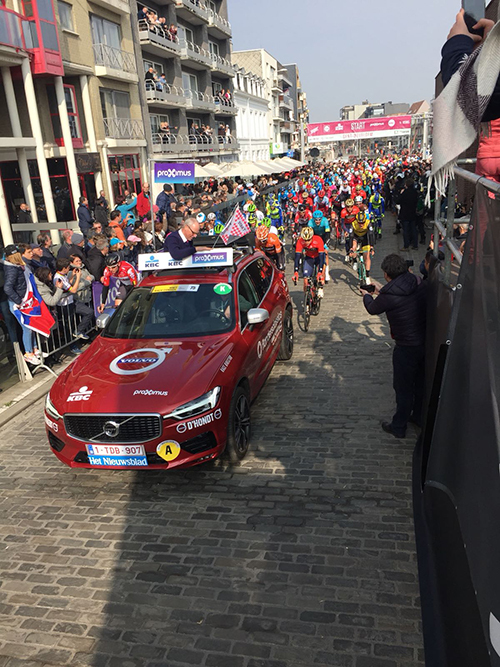 145 Jasper De Buyst Lotto-Soudal s.t. 146 Tony Gallopin Ag2r La Mondiale s.t. 147 Kris Boeckmans Vital Concept s.t. 148 Dries De Bondt Veranda's Willems-Crelan s.t.